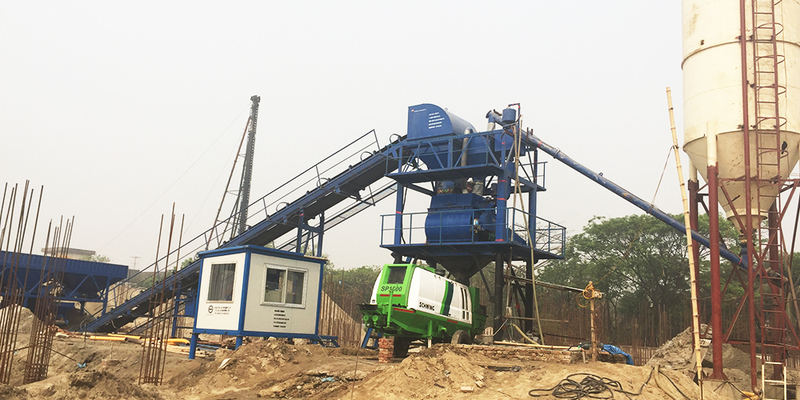 A special designed HZS35 concrete batching plant, using delivery belt type aggregate feeding , was installed in Bangladesh, Dhaka at May, 2018. This plant was made with a Twin shafts Concrete Mixer 0.75m3 volume, and Controlled by Siemens PLC, which provide a much precise weighting can insure the Quality of concrete. With 2.2m discharge height , to match a 1.5m height Concrete Trailer Pump. Trailer pump can pump concrete over 400m distance on work-site. Since 1982 UNIQUE started to producing Concrete Mixers, after over 36 years development, UNIQUE had gather much experience and been very professional in Concrete producing and Pumping&Placing, which help us can give a best solution in various situation. To get more UNIQUE project cases at your local , or a Concrete Batching Plant , please find us. UNIQUE Concrete Mixer Pump is a Portable type Concrete Mixer with Pump combine, which got Concrete Mixing Capacity around 30m3/h, and Pumping capacity 40m3/h. It can pump to Vertical distance 100m, and Horizontal distance 400m. Use Deutz brand Diesel Engine or Electrical Motor, easy operate and maintain. It is very suitable for Middle and Small project.